Tech News article featuring VITP Tenant Cisco Systems! Cisco Systems Inc. plans to offer cloud computing services, pledging to spend $1-billion over the next two years to enter a market currently led by the world’s biggest online retailer Amazon.com Inc.
Cisco said it will spend the amount to build data centers to help run the new service called Cisco Cloud Services. Cisco, which mainly deals in networking hardware, wants to take advantage of companies’ desire to rent computing services rather than buying and maintaining their own machines. The company said it plans to deliver the service with and through partners including Australian telecom service provider Telstra, tech distributor Ingram Micro Inc., and Indian IT company Wipro Ltd.
“Customers, providers and channel partners … want to rapidly deploy valuable enterprise-class cloud experiences for key customers – all while mitigating the risk of capital investment,” Rob Lloyd, Cisco’s president of development and sales, said in a statement. Cisco’s plans were first reported by the Wall Street Journal. Enterprise hardware spending is dwindling across the globe as companies cope with shrinking budgets, slowing or uncertain economies and a fundamental migration to cloud computing, which reduces demand for equipment by outsourcing data management and computing needs. Microsoft Corp. last year said it was cutting prices for hosting and processing customers’ online data in an aggressive challenge to Amazon’s lead in the growing business of cloud computing. We are happy to finally be able to announce that Victoria Makerspace and Biobit Enterprises have taken up residence at VITP! After some building construction to bring the Innov8 Hub up to code (you may have noticed the new staircase on the front of the building!) and some major renovations to two of our suites, these two companies now officially have a home. You can expect to hear a lot about Victoria Makerspace over the coming months as the community becomes aware of everything this place has to offer. The Victoria Makerspace is a member-run non-profit toolshare collective. They maintain a shared workshop of woodworking, metalworking, electronics, biology, and other light manufacturing tools. They teach classes and the workshop is available to members 24 hours a day, 7 days a week. They exist to help their members develop and use technology to support everything from hobbies to startup businesses. We hope that employees at the Vancouver Island Technology Park will check out our new tenants and hopefully continue to get involved in all of the exciting activities taking place. Check them out on our website: Victoria Makerspace and BioBit Enterprises! Girls Raising, a community based around assisting and fostering the growth of women founded startups, in addition to all like-minded entrepreneurs and investors, originated from New York and has since expanded to San Francisco, Toronto and Vancouver. The empowering organization is dedicated to opening doors, creating an audience for established and up-and-coming female innovators and influencers and bridging the tech-sector’s gender gap. For many years, the skewed ratio between men and female workers has formed a barrier for emerging female talents. There simply wasn’t enough resources, platforms and opportunities committed to helping women achieve their goals. Men conduct business in certain way and women conduct business in another way; it’s not about which is better—it’s about how to nurture both forms of communication effectively so that entrepreneurs and investors of either gender can develop the best work possible. The initiative starts with getting promising founders and entrepreneurs out and interacting, sharing resources and developing new ideas. On March 27, Girls Raising will be hosting another event from their Presentation Series in Vancouver. The private event will showcase presentations and panelists, featuring women entrepreneurs and investors that have overcome the gender gap and found success as leaders in the industry. The events are just another actionable step towards supporting, educating and encouraging females to choose tech for a career option. The event in terms of presentation will cover two specific areas: the finance of a business and the founding of a business. Two women specialist in each of those fields will present, offering tips to raise a company into the green. The event will also see a preselected group of entrepreneurs pitch their ideas to an established panel and receive feedback and potential investment opportunities. Girl Raising caps their active events at 100 people in order to keep the quality of interaction high and insure that everyone gets something out of it, whether they are there as an attendee, panelist or a presenter. The tech-ecosystem can often be too vast and intimidating for many, but Girl Raising supports the adventurous attitudes of entrepreneurs and understands that there is going to be challenges and adversity, regardless of your gender. All 12 sessions of TED 2014 will be streaming live in the VITP Conference Room throughout the week of March 17th – 21st. Feel free to drop in and join us to watch an amazing lineup of over 60 intriguing and inspiring speakers! View the TED website for full details and bios on the speakers! Cisco Systems Inc. has chosen Toronto as one of its four new global innovation hubs, a move it says represents an investment of $100-million in the city over 10 years. Canada’s largest city joins Songdo, South Korea, Rio de Janeiro, Brazil and another as-yet unnamed location that have been slated as centres for innovation, the company said Wednesday. Cisco said in December it plans to expand in Ontario, announcing investment plans for up to $4-billion to build research and development facilities in the coming decade, with the Ontario government agreeing to kick in up to $220-million. Today’s announcement marks the first stage in that plan. “This North American hub for thought leadership and experimentation will bring together start-ups, technology and services partners, academia and customers to rethink and transform the status-quo,” the San Jose, Calif.-based company said in a release. Many will welcome the news, given that Canada has lagged its peers in measures of innovation, particularly in venture capital investment and business R&D spending. Toronto’s innovation centre marks a $100-million investment in design, infrastructure, staffing, technology and operational costs over 10 years. It will occupy about 15,000 square feet of office space in Oxford Properties’ RBC WaterPark Place, due for completion in the spring of 2015. The building will also become Cisco’s new Canadian headquarters. The release didn’t say whether provincial or municipal governments are contributing to its Toronto investment plan. Cisco said in December its expansion plans could lead to the creation of up to 1,700 high-tech jobs in the coming years. The government’s contribution sparked a debate over whether the province should be funding a profitable, multinational company. The Internet of everything refers to the ability to connect devices such as heart monitors, cars and thermometers to the web, and monitor them in real time. Cisco sees it as a $19-trillion opportunity in the coming decade, including $500-billion for public and private-sector organizations in Canada. Twenty-four-hour access to a 3D printer. Made-to-measure women’s boots. A festival celebrating entrepreneurism in Atlantic Canada. What do they all have in common? They’re some of the success stories sprouting from communities across the country as Startup Canada continues to link entrepreneurs, mentors, and resources under one virtual roof. A grassroots, entrepreneur-driven movement, Startup Canada is the first organization of its kind in the world. Its rapidly growing membership includes entrepreneurs from every conceivable industry and demographic—from fashion designers and filmmakers to chefs and computer programmers. Because entrepreneurship can be an isolating, solitary endeavour, Startup Canada partners with local community organizations and institutions to provide networks, mentorship, and meeting spaces to exchange ideas and build relationships. Regular events include in person and online networking opportunities, seminars and weekend conferences, where people keep connected within and beyond the boundaries of their geographic regions. For the network to drive innovation and economic growth in a city, entrepreneurs and communities must learn from, and feed off, each other. Last May, Startup Canada launched 15 pilot Startup Communities in cities ranging from Langford, B.C. to Charlottetown, PEI. Another five were added last November, including Calgary, Niagara, and Waterloo. These communities have led to connections between 250 businesses, 500 entrepreneurs and 70 enterprise partners. Startup Communities will continue to be an important theme for Startup Canada in 2014 and beyond. In just a short time, the effects of like-minded individuals working together have been exceptional: Startup Smithers is creating a venture capital fund with BC Forest Council to invest in rural entrepreneurship. Startup Winnipeg has created a downtown space that provides round the clock access to equipment like a high tech 3-D printer and scanner to enable companies to finish prototypes. The idea of supporting entrepreneurs within the community and from the ground up first became popularized through a 2012 book written by Brad Feld, a Boulder, Colorado-based entrepreneur-turned-venture capitalist. The book, Startup Communities, outlines the four essential characteristics of a startup community, which Startup Canada is embracing. Firstly, only entrepreneurs may lead the community. While they will rely on the support of partners such as government, the media, and investors, those partners play only supporting roles. Second, leaders must be willing to commit for 10 to 20 years, put the interests of the community ahead of their own and be prepared to donate ideas, time, effort and money without knowing whether they will receive anything in return. Thirdly, to remain sustainable over time, startup communities must be all inclusive, allowing people and ideas to move freely. Finally, the startup community must hold activities and events that will engage and bring people together all the time – from coffee meetings and showcases to competitions and conferences that attract thousands in attendance. As new communities are being recruited on an ongoing basis, the vision of Startup Canada is for every city in Canada to have a Startup Community. Startup Canada is leading the way both nationally and globally as a bridge-builder between entrepreneurs. Peter Kuran, CEO, UVic Properties, today announced that Theresa Dickinson has been hired as the new general manager of UVic’s Swans Suite Hotel and Brewpub. She joins UVic Properties on Feb. 24, 2014 and will be responsible for providing effective leadership and direction for the operational and financial performance of the Swans hospitality assets managed by UVic Properties. The Swans property includes a boutique hotel, brewpub and restaurant, brewery, liquor store and the Wild Saffron Bistro. UVic Properties is responsible for management of: Heritage Realty Property, which includes Swans Hotel and Brew Pub and other downtown residential and commercial property bequeathed to the university by Michael Williams; 194,000 square feet at the Vancouver Island Technology Park and 41,000 square feet at the Marine Technology Park; as well as other off-campus holdings such as the Queenswood and Dunsmuir properties. The University of Victoria continues to collaborate with the Vancouver Island Technology Park in hopes of showcasing the many benefits and opportunities they have to offer. 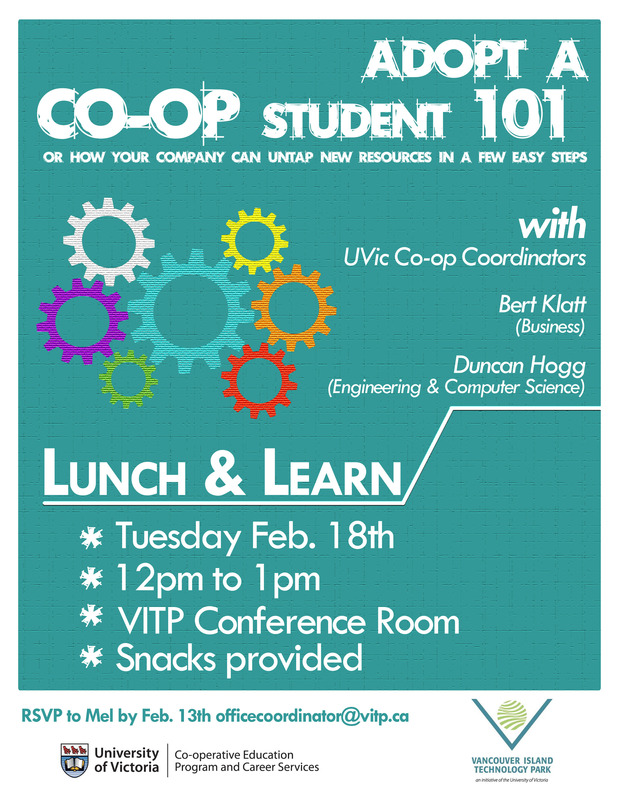 UVic has a variety of resources that the tenants and employees of VITP could find extremely useful and we are happy to continue to host information sessions to help get the word out. 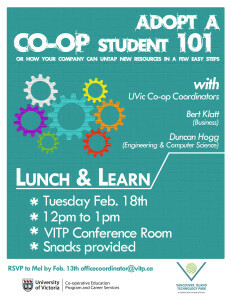 On Tuesday February 18th, UVic Co-Op coordinators present “Adopt a Co-Op Student 101” with presentations by both the business school as well as engineering and computer science co-op programs to re-introduce the program to VITP. 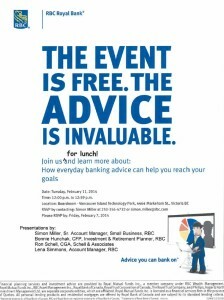 A light lunch and learn will take place in the conference room from 12-1pm and we hope to get as many tenants and employees out as possible to learn about this excellent program and how it can benefit your company. The following week on February 25th, another one hour “lunch and learn” in the boardroom from 12-1pm is a UVic MBA information session. 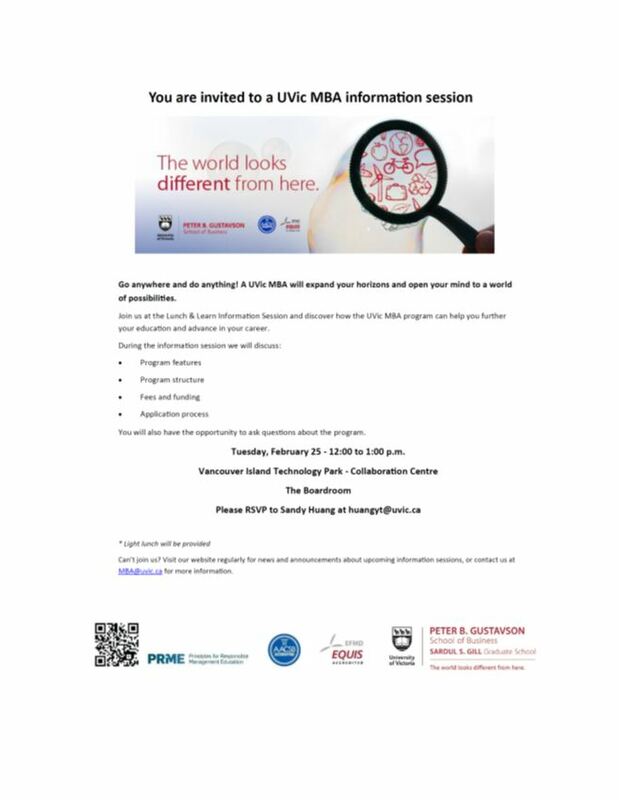 Learn how the University can help you advance your career and education! Check out the details on the signs below, and please RSVP as soon as possible. These are events you don’t want to miss, and why not get involved in activities around your workplace! 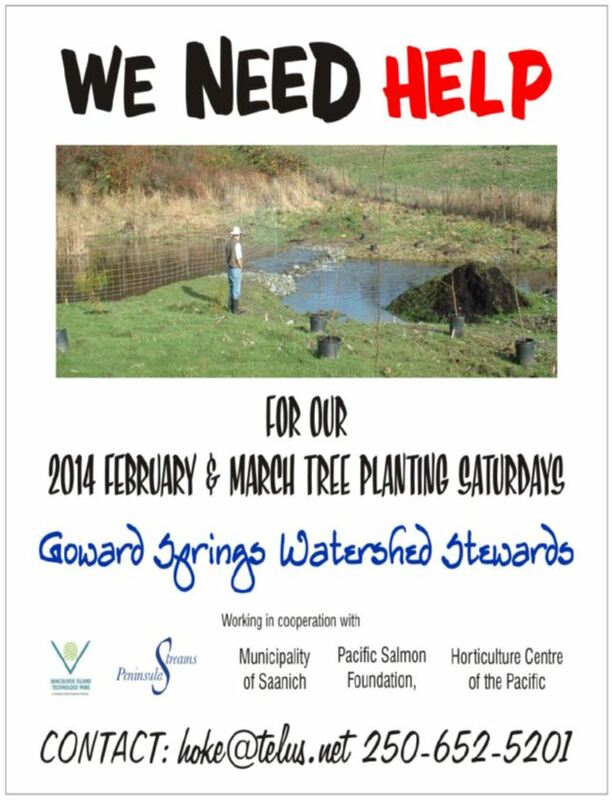 In conjunction with last week’s post and GSW tour, we are looking for volunteers to help bring this project to life! For a refresher, click here. 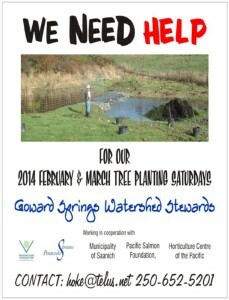 If you or anyone you know would be interested in volunteering some time, please contact Hoke. 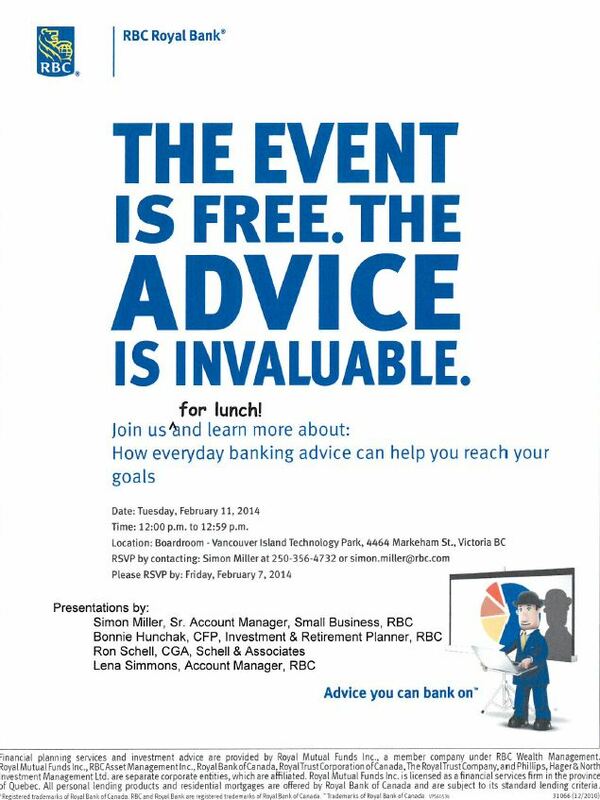 What: Join an RBC team for lunch and learn more about how everyday banking advice can help you reach your goals!